With 60 locations across the country and national magazines revering it as one of the “best beauty stores”, it’s about time the famous, make-it-yourself Bath Junkie lets us Phoenicians partake in the bathing frenzy! Well there is no need to wait much longer, the new Phoenix location in Desert Ridge and first location in the great state of Arizona will open its doors tomorrow, August 22, at 11 a.m. and will come fully equipped with celebratory drawings and a generous 20 percent discount. So grab your girlfriends and head to The District in Desert Ridge… and trust me it won’t be long until you’re an addicted “bath junkie” just like the rest of the nation. The beauty of Bath Junkie is each customer can customize his or her bath blend to suit his or her own needs and desires, right in the store! Guests can choose from many colors and over 200 fragrances of either phosphate-free bubble bath, paraben and mineral-oil free moisturizers, talc-free liquid powder, exfoliating salt scrub, spa tub-safe bath crystals, alcohol-free body mist, SLS-free shower gel, everywhere foaming body wash, hair conditioners, anti-bacterial hand wash or even Bath Junkie’s full line of pet products. If you aren’t so creative with the blending, Bath Junkie provides fragrance menus of some “favorite blends.” Customers can also select their products’ tints, allowing them to simply choose a favorite color or create the perfect match for their bathroom or kitchen color scheme. 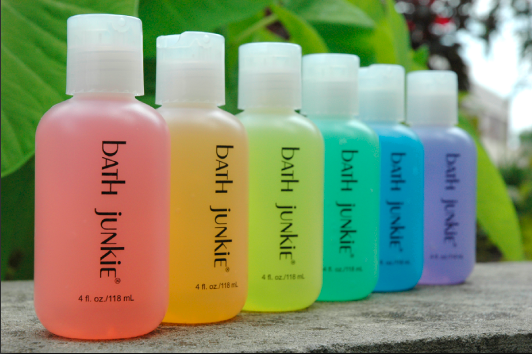 Bath Junkie products are safe for even the most sensitive skin. Most are paraben and SLS-free. Bath Junkie does not test on animals and promises to only use “the best” formulas. I am so excited about Bath Junkie’s 20% off grand opening sale this weekend! Time to stock up! I’ve never been here! It looks like a cool store, and I like that the products are paraben free. I start my Christmas shopping soon and this looks like a one-stop shop for those “extra” gifts! ahh..how cute!! i have never been in one!! I just went here- it is really neat. Wishing you all the best from bath junkie NOLITA NYC!!!! Looks awesome! Perfect to stock up for those last minute host gifts…birthday happy hour invite…etc. No lavender? Thanks for the feature and the information!!!!! What a cute name for a shop…and I like Sarah’s idea of getting some Christmas shopping done now! Super cute! As a proud bath junkie, I can’t wait to overdose in this cleansing paraphernalia!! What a fun way to personalize a visit for family and friends. What a cool store! I bet it smells so good in there. Bath products are a great gift idea. It is easy and the recipient always loves it. How can you go wrong with something that smells so good?